Shoes with vibrating sensors that guide the wearer in the right direction, glasses that maximise the remaining vision of partially sighted people, and an audio-bracelet that enhances spatial awareness were just three cutting-edge devices on show at a major technology conference. The two-day TechShare Europe event in the Glasgow Science Centre, organised by RNIB Scotland. explored how new technology can transform the aids and adaptations that blind and partially sighted people use for everyday living. Representatives from technology giants Apple, Samsung, Google and Microsoft attended to discuss the issue of accessibility of their products. 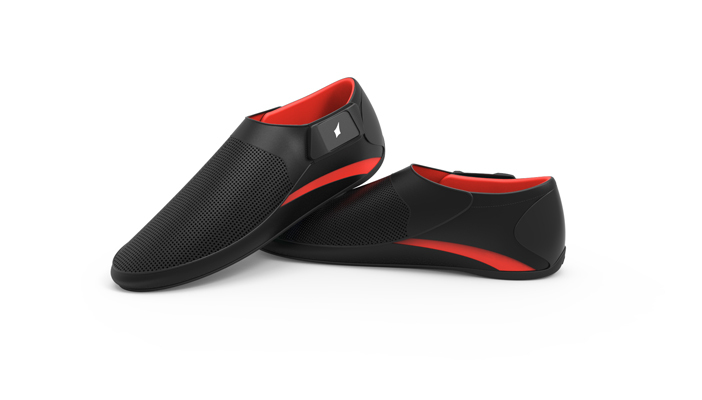 The Lechal shoes (pronounced lay-chull) created by Ducere Technologies in India, are embedded with Bluetooth-connected sensors that link with Google Maps. Wearers set their phone to go somewhere and the shoes gently vibrate left or right to indicate which way to turn. The Audio Bracelet for Blind Interactions has been developed to improve movement. Stephen Brewster, professor of human-computer interactions at Glasgow University, said: "Blind children engage with their immediate environment much less than sighted children. As they don't have visual feedback to calibrate their movement, spatial accuracy is lower. Audio feedback from the bracelet helps them to build connections and spatial links between objects and the hand wearing the bracelet. We found participants were able to reach for objects more accurately." The smart glasses, developed by RNIB and researchers at Oxford University, incorporate a special 3D camera to separate and highlight objects ahead of the wearer. Last year, the prototype won a £500,000 Google Impact Challenge award to develop a more compact version.